I just want to know if this product works. Ive used Frontline and Advantix in the past and it did alright. Frontline seems to be failing though. How well do you recommend this product. This is very powerful medicine made by Bayer. It is their most popular brand as it really works. We would definitely recommend it. However, Advantage Multi (Advocate) covers Flea and intestinal parasites (almost all of them) including heartworm but no ticks. Frontline and Advantix cover flea and ticks but no intestinal worms. 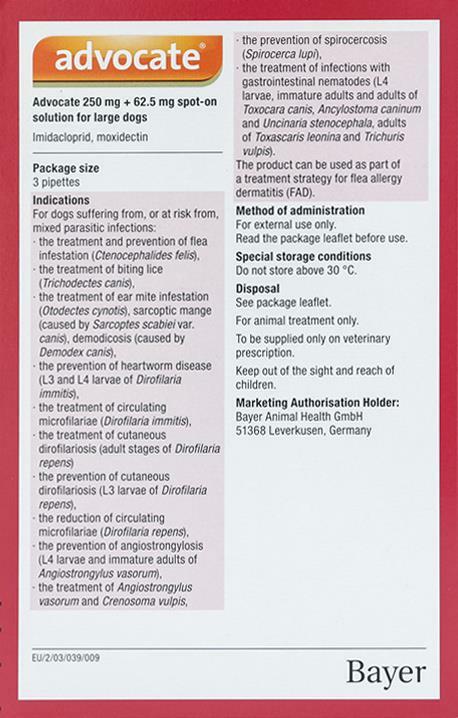 If you wish flea+ticks medicine we can also recommend Nexgard which produced by Merial (makers of Frontline). It is relatively new but we have great feedback from our customers. Is this product safe for dogs with ivomectin sensitivity? And does it kill lice? Advantage Multi doesn't contain ivermectin. Its active substances are: imidacloprid and moxidectin. So it should be saf but please get advise from your Vet before apply any medicine to your pets. It does treat lice. Excellent product. Very fast and efficient delivery service. Very Happy with my product! Great price and saves you money going to the Vet! Thank you PetBucket!